Hello, Angie here from Bob Ward & Sons, over BUTTE & BOZEMAN way…ready for winter weather on the water at last? Looks like we’re headed in that direction! BOZEMAN is expecting snow, so YOU can expect some slush & slippery conditions in the GALLATIN, for sure…no ice shelves yet reported tho, so that’s decent news…the river’s LOW, but Nymphing is paying off, if you skip from deep pool to deep pool, you WILL be successful! Stoneflies trailing a Baetis nymph or Midge larvae is the choice of experts…The UPPER MADISON is a similar story, some slush, but you will also encounter winds here, so come prepared! Stick to areas on the river around Ennis to find the really deep holes where all the trout are concentrated…a short float from deep hole to deep hole can be excellent, tho wading is also spot-on here! Copper Johnsons, Yukbugs, Caddis Emergers are all welcome Nymphs here…the LOWER MADISON is still living with vis issues, so if you go, try your streamers nice & slow, & go with the yellows, golds or browns…Goldbead Krystal Buggers in Olive, Yellow Fathead, or an Olive/Pearl Zonker are good! The YELLOWSTONE is ok for now…no ice floes yet, tho winter weather will soon do this river in for a while…if you can get out of the wind, you’ll do well with nymphing Goldenstones, Lightning Bugs, Crayfish & such…trail a small soft hackle for extra attraction! 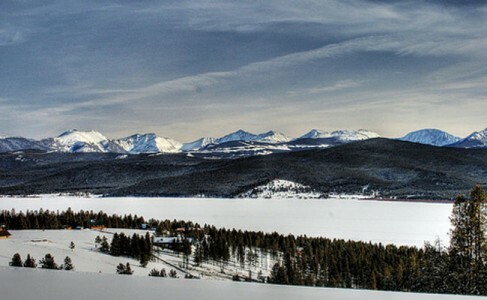 We’ve got reports that holes are being drilled on HEBGEN & ENNIS lakes, so if you want some of that ICE action, these high mountain lakes are ready for you! Chartreuse & Hot Pink jigs, Glo Hooks with Maggot tips, as well as tasty Crawlers, have been in use thru the ice. BUTTE should also get some snow and cold, & the good news is, GEORGETOWN (shown in the picture above) is sporting 8-10″ of ice on most areas of the lake, with about 5″ near the Pump House. Rainbows & Brookies are practically jumping right on the jigs, says the Butte staff! DELMOE has 8″ of ice cover all over, & is a favorite place right now too. Swedish Pimples or Jigging Rapallas are the ice angler’s dream, but Northland Tackle Buckshot Rattle spoons or Forage Minnows are also great jigs! CLARK CANYON is NOT in a frozen state yet, however, so don’t head that way expecting to drill QUITE yet! Both the BEAVERHEAD & the BIG HOLE are productive and not too iced up yet, tho again, you may encounter slushy conditions. Golden Rubberlegs, Red Belly Yukbugs, or a Pearl Lightning Bug are good standbys here, or deaddrift your Zonkers on either river for some above-average Streamer action. The JEFF is windy, somewhat dirty, & a real challenge right now, so we’d advise sticking to the BEAVERHEAD or trying out your new ice shanty this week at these other locales! BRIDGER BOWL skiing opens this weekend in Bozeman, & you won’t want to miss that, so head on into the stores & get your last-minute ski gear or tune-up before heading out! Check out the huge clearance sale on firearms while you’re there…Santa & Bob Wards wants you to have nothing but the BEST! I want you to have the best fishing advice available, so I’ll be back next week with more!